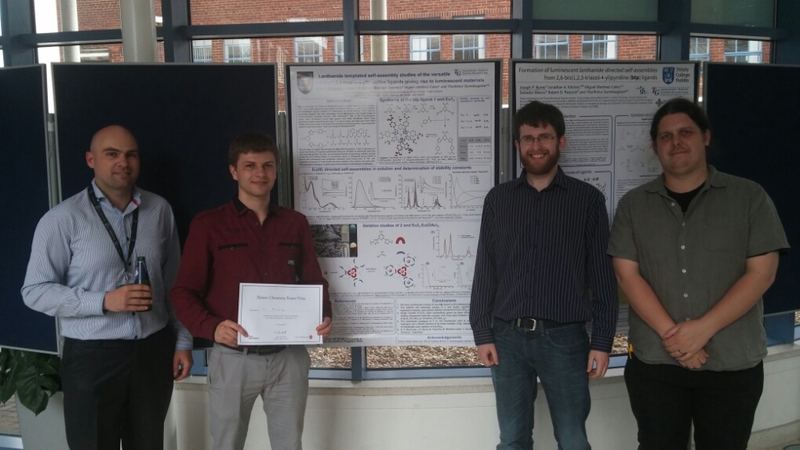 Second year PhD student Eoin McCarney and postdoctoral researchers Joe Byrne and Chris Hawes attended the Southampton Supramolecular Symposium, which was organised by Dr Jonathan Kitchen (a former postdoc in the TG Group who is now an academic in University of Southampton) and Dr Steve Goldup. Eoin was presented with the Nature Chemistry poster prize by Head of Department, Prof Phil Gale, for his poster on the lanthanide directed self-assembly and gel formation of btp ligands. Various medalists and prize-winners spoke at the meeting, including Assoc Prof James Crowley (Otago), Prof David Leigh (Manchester), Prof Andrew Cooper (Liverpool), Prof Micheale Hardie (Leeds). Chemists from Trinity College Dublin have achieved a long-pursued molecular first by interlocking three molecules through a single point. Developing interlocked molecules is one of the greatest challenges facing researchers, and the Trinity chemists’ achievement represents the first time three molecules have been linked in a non-linear ‘chain-like’ form. Interlocked molecules have major applications in nanoscience, as they can be used as molecular shuttles and switches, and because they can function as molecular motors, mimicking the action of many biological systems. Molecules that are interlocked together are unique in that they are not connected by any chemical bonds, which give other compounds their individual, defined structures following chemical reactions. Instead, the interlocked molecules typically exist as rings that together form a chain, like the pattern seen on the front cover of the iconic Book of Kells. Led by Professor of Chemistry at Trinity, Thorfinnur Gunnlaugsson, the work was carried out by PhD student, Dr Christophe Lincheneau, who is now a postdoctoral fellow at CEA Grenoble. Dr Lincheneau used a metal ‘lanthanide’ ion called Europium and a catalyst developed by the Nobel Laureate, Professor Robert Grubbs of Caltech, to interlock three molecules through a single point. The important discovery was recently published in the high-impact journal of the Royal Society of Chemistry, Chemical Communications. It was also featured in Nature Chemistry’s April issue as one of three Research Highlights. Europium luminescence is a powerful tool with wider applications. For example, it is currently being used to aid authorities in the prevention of counterfeiting, while luminescent lanthanide ion complexes are employed in the various denominations of Euro notes as red and green-emitting dyes. Professor Gunnlaugsson’s research group, which is located in the Trinity Biomedical Sciences Institute, was also able to accurately determine the mass of their interlocked ‘catenane’ by using the School of Chemistry’s state-of-the-art nuclear magnetic resonance (NMR) spectroscope and mass spectrometry facilities, which are part-funded under the HEA PRTLI Programmes. Their published research was funded by Science Foundation Ireland under the 2010 Principle Investigation Programme. “We are now actively pursuing the development of other interlocked molecules and self-assembly structures using the lanthanide template design strategy we have developed and discussed in our recent publication. We hope this is just the first of many exciting and important discoveries,” added Professor Gunnlaugsson.